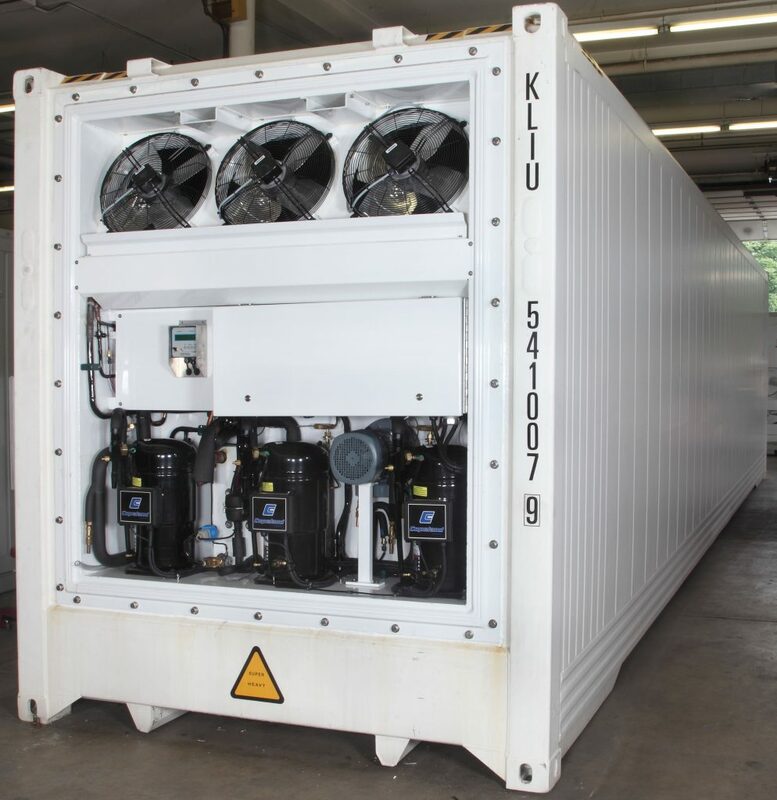 Klinge Corp’s Portable Blast Freezer Container, Model CBU-30, is primarily used for the quick freezing of yellowfin tuna, other high-value seafood and meat. Our picture frame style freezer is designed for freezing cargo to -60°C (-76°F). It is mounted to 20’ or 40’ ISO containers or trailer bodies. More and more companies are using lower temperature freezing machinery to transport high value seafood and meat. This is because blast freezing means substantially reduced transportation costs as the fish can be transported by container ship rather than air freighted. The CBU-30 is unique in that its evaporator fan draws air through the load to ensure even temperatures throughout the load. Many standard units are not equipped with an evaporator fan system designed to accommodate cargoes with high-pressure drops. Without the special design, airflow would be reduced and the blast freezing process would take considerably longer. Contact a Klinge Group Specialist Today! » Designed for freezing cargo from -20ºC to -60ºC (-4ºF to -76ºF). » High capacity ideal for freezing meat and seafood. » Full Airflow: Even in loads with a very high cargo internal pressure drop. » Unique Design: Many standard units are not equipped with an evaporator fan designed for cargos with high pressure drops. » Even temperatures throughout cargo. » Efficient Airflow: Evaporator fan and adjustable ceiling provides efficient airflow control, which is essential for quickly lowering cargo temperature. 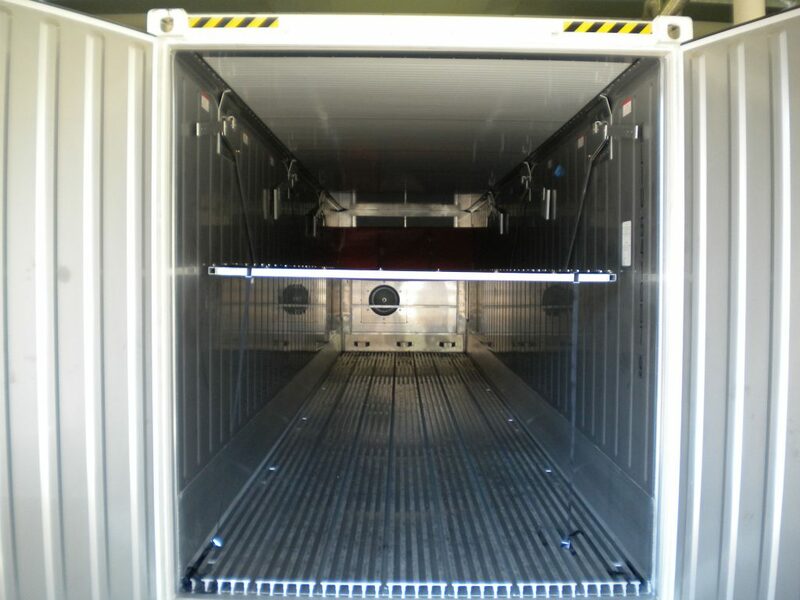 » Convenience: Blast freezers can be used in containers or trailer bodies. maximum airflow is pulled across your cargo. This ensures quicker cooling and less overall power use. A wide range of companies and suppliers use the CBU-30 and related refrigerated sushi transport containers to move product from fishing markets around the world to diners’ plates. However, as tastes change and eaters become more adventurous, the variety of fish being harvested commercially and shipped internationally has grown. The growing popularity of sushi around the world has created a unique shipping need that Klinge fills with its line of sushi freezers and seafood transport containers. Complicating this is the fact that different species — and different regions — have unique handling requirements. Below, we’ve prepared a brief overview of how to transport several different types of fish safely, following recognized best practices adopted by American and international regulatory bodies. Commercial fisheries around the world catch an estimated 100 million tons of fish each year, of which roughly 25% ends up frozen. The industry employs an estimated 28 million people at all stages of its supply chains. Because fish can spoil if not properly handled and transported, safe shipping is big business. Individually frozen fish. Individually frozen fish can range from medium-sized species such as salmon and snapper, to prize Bluefin tuna. Individually frozen fish is processed whole, gutted, or dressed. Fish frozen in blocks, whether whole or filleted. Freezing fish in blocks is a common practice when handling smaller species destined for further processing. Most blocks are less than 10 cm thick and usually weigh either 35 or 50 lbs. — standardized sizing helps make shipping easier and freezing more predictable. Packaged or blocked shellfish and cephalopods. Cephalopods such as octopus and squid, as well as small shellfish like mussels and crabs, are packaged in frozen blocks or crates. Typically, these are over-wrapped in plastic and shipped as part of a larger carton. Individually frozen shellfish or fillets. Finally, it is common to individually freeze fish fillets, or larger shellfish such as lobsters, particularly during last-mile shipping en route to a restaurant or retail food distributor. Most authorities recommend freezing fish to -30°C. However, fish don’t freeze according to a linear curve — in a conventional freezer, their internal temperature will remain stable at around 1°C for several hours. This causes large ice crystals to break down cellular walls, which can lead to a loss of freshness and quality. For this reason, most shippers use fast blast chillers such as our CBU-30. Because blast freezers work quicker than conventional refrigeration units, accuracy is critical. Insufficient freezing time can compromise your product, while too much time spent in a freezer leads to higher costs and shipment delays. In addition to the type of fish and the way it is packed, it’s also important to take into account factors such as the accuracy of the freezer and the speed of airflow within it — faster airspeeds equal shorter freezing times. The Klinge Corporation CBU-30 is one of the most advanced, accurate blast freezers on the market today. It is both portable and capable of quickly bringing a large fish to temperature, making it ideal for use as a refrigerated sushi transport container. Contact our office to learn more or request a quote.